For the second year in a row, Chile is the winner of the "World Travel Awards", in the category Best Adventure Tourism Destination. The achievement is not minor since in this 2017 competition, the country had to compete with icons of World tourism such as Thailand, Australia, New Zealand, Canada, the United States, Japan, Ecuador and Sri Lanka. The ceremony was held in Phu Quoc Island, Vietnam. Other important awards granted to South American countries were Peru with Machu Picchu as the "Best Tourist Attraction in the World" and Bolivia, as "Best Cultural Destination in the World". The magnificent natural landscapes offered by the Chilean geography and the diversity of activities that can be performed there, were decisive for this new accomplishment. All the countries have their own charms and natural wonders, but the fact is that Chile stands out since the visitor can soak up landscapes and experiences as diverse as the vastness and archaeological richness of the Atacama Desert in the extreme North to the immensity of Patagonia, in the southernmost point of the Americas, a mixture of pampas, glaciers, eternal snow and wild nature, where the options of carrying out an endless number of adventures are numerous. On the other hand, the city of Punta Arenas, known as "The Capital of Patagonia" is one of the main gateways to the Antarctic, located a little over 2 hours from the White Continent. Currently, great emerging destinations in Patagonia are traveling along the Carretera Austral, navigating through the Southern Channels, visiting beautiful National Parks such as Torres del Paine, Laguna San Rafael, Parque Nacional Queulat, Parque Pumalin and several others, the island of Tierra del Fuego, shared with Argentina, the dreaded Cape Horn, union of 2 Oceans and meeting point of daring adventurers who try to cross it. 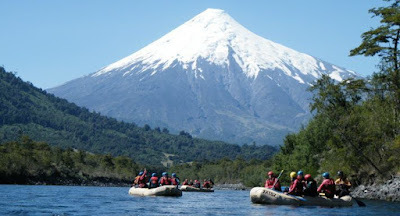 But it is not only Atacama and Patagonia, throughout its crazy geography, Chile offers multiple and varied settings for the practice of Adventure Tourism. In the South- Central part of the country, the Cordillera de Los Andes is a great attraction for snow lovers and related sports, with World Class Winter Centers, many of them a few kilometers from the capital Santiago, as well as many others in Southern Chile. During the summer season, many of these centers turn into cozy Resorts to enjoy the surrounding nature, make mountaineering, trekking, horseback riding, mountain biking, etc. With regard to water sports, Surfing and Diving are becoming increasingly popular especially in Northern and Central Chile, where some of the most important beaches for the practice of these recreational activities are located. The remote Easter Island, in the middle of the South Pacific, jealously guards the secrets of the ancestral Rapa Nui Culture, whose Moai and Ahu (Ceremonial Altars), are mute witnesses of an extinct civilization, accompanied by a Subtropical climate and Nature that enchant the visitor. The Region De Los Lagos (Chile's Lakes Region) is another inexhaustible source of activities for those who like adrenaline, surrounded by a spectacular environment, volcanoes and snowy mountains, lakes of iridescent waters, rivers, waterfalls and remote fjords. The numerous rivers of the South of Chile are a true paradise for Sport Fishing lovers but also some of them offer a unique setting for the practice of Kayaking and especially Rafting, with rapids that attract adventurers from all over the World. These reasons and many others make Chile one of the most emerging tourist destinations, receiving the just ended 2017 a total of 6,449,883 foreign visitors, according to official data delivered by the Undersecretary of Tourism.